There's nothing worse than a wedding that we remember for the wrong reasons - maybe the Vicar got the groom's name wrong or there was a fight at the reception, or even just because one of the guests had one too many drinks and made a show of himself. There are so many things to plan when you're arranging a wedding, and one of the most important is choosing the music for your big day. 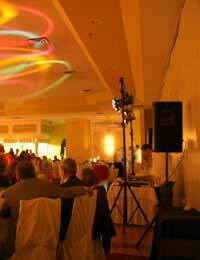 The standard of your band or DJ can really make or break the reception party. What you really don't want is a someone who decides that rather than staying in the background and making sure that the night goes smoothly, they'll use your big day as a showboat for their own 'talents' - whatever they might be. So you don't want a band or a DJ that's going to try and steal your thunder. You want a band that people remember for the right reasons - but that don't take over the whole event. So how can you make sure that when you book your reception entertainment, you don't end up with a show-stealing egocentric that would put your tone-deaf karaoke mad AuntyJenny to shame? If you're not having a particular theme for your wedding and you just want a band or DJ that will fit in with the feel of your day, by far the best way to find a suitable act is via reputation, or word of mouth. If you hear someone talking about a great band they saw at a function then ask what kind of music it is that they play - and if it sounds right then ask for a card or details, and follow them up. Go and see them at another function or gig, and decide from there if it's the right kind of act for you. This way you've heard them play and seen how they perform - you can measure their professionalism and make sure that they will give the right impression on the big day. If you are having a themed wedding, then you need to consider this when choosing your musical entertainment. For example, if you're having a traditional Scottish wedding, complete with kilts and sporrans, then you may want Scottish pipers or beautiful gaelic voices serenading your guests as they celebrate your nuptials. Or if you've decided to for a traditional white church wedding, you might just want a huge knees up with lots of cheesy 80's dance hits, or you might plump for a more subtle and classy instrumental band - the choice is completely down to you and what your preferences are. If you're not sure what to go for, consider the guest list. Are you having a small get together with your closest friends who mostly met at university or in the middle of an indie festival in the pouring down rain? Or is it more of a family do that would benefit from a typical pub band who do cover versions covering Dolly Parton to Queen - giving everyone something to dance to. The golden rule when choosing your wedding music is to remember that you are never going to be able to please each and every one of your guests - so don't even try. Choose the band or DJ that appeals to you and remember that it's your big day, and you should be able to dance to whatever the hell you like - even if it's a Bee Gee's tribute band! So go with what you know - and like. If you're a fan of musicals,then seek out a specialist band who play songs from your favourites -such as the Sound of Music and Chicago. They're great for high-kicking, high-emotion songs, and they'll certainly put on a show that most of your guests can appreciate, even if it wouldn't have been their first choice. When making your final choices, remember that you and your family will want recall your wedding night fondly for the rest of your lives - so make sure you choose someone who will ensure that it's remembered for all the right reasons! Don't choose anyone you have reservations about, because if it's a disaster, it really can ruin the night. Most of all, don't lose sight of the fact that it's your night - one of the most important you'll ever experience - and choose music that will take you right back to that night for years to come.